Oh, Hill's, why do we so often forget to mention you? Even more so, why do we so often forget to eat your food, when we often stop by for your beer selection? Really, food aside for a second, Hill's has a tendency do something special with the special beers. Like when the Abyss '11 hit and they brought out kegs of not just it, but the '10 edition also. That was pretty great, and those kind of vertical tastings are rare around these parts. Hell, during our last visit they still had Black Butte XXIII on tap. Seriously! And this time we didn't forget about the food, thankfully. There are plenty of reason to visit for it alone. 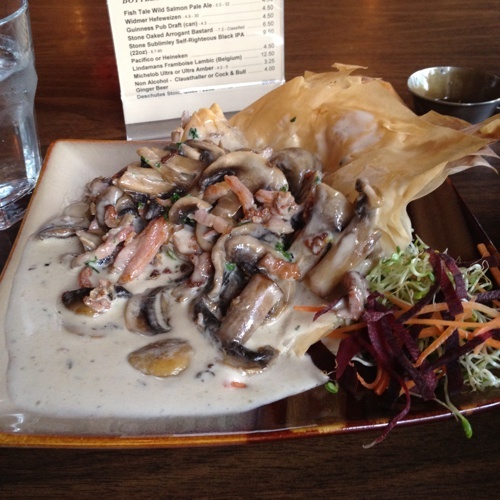 The prosciutto and mushroom plate, for example, is just what it says it is; sautéed mushroms and prosciutto in a flavorful sauce, served with phillo. Simple and tasty. I tried the elk burger, which was perfectly cooked and served on a camelina seed spelt bun. Too often the bun is the downfall of the burger, but this one had the quality of a good loaf of bread, and I could probably have eaten it by itself. The mustard, too, added a nice kick to the overall picture. All of this is, as most know by now, house made, and it shows. It's in the details, just those little things you don't see at the many, many (many) places around town that choose to go the Sysco route. Finish the meal up with the s'mores and you'll leave on a happy note. These are unlike any we've seen before; the marshmallow served in a large square, with crackers there for dipping. All, of course, covered in chocolate. We like Hill's. You probably should stop by soon, if you, like us, have forgotten how good they are. Do you recommend Hill's Restaurant & Lounge? Make your voice heard!